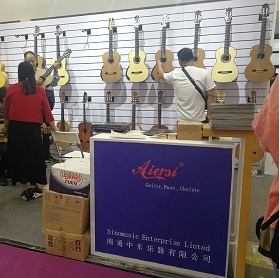 Choose Aiersi brand guitar, Enjoying Happinesss with your Families! I am a left hander and play with small jazz groups in Melbourne Australia. For years I have been searching for a reasonably priced quality instrument. For years lefties have not been considered in this market. No longer ;this is a quality reproduction made by quality luthiers. the aiersi guitars are among the best quality available ,, in china many make selmer models but the aiersi are exceptional value for the money ,, archtop and back ,great selmer style sides shape and overall dimensions are 100 % . all woods that are used are top notch ,,the bridge is rosewood and is made very good to specs of selmer..
i am luthier artisan my self ,,i have sold many guitars as saga and altamira and i love the aiersi far beyond them. the sound is not bass heavy but dry with a little bass,, cutting mids and high tones. The guitar is very good and had the typical gypsy/manouche sound that I like. She look also very good. I am enjoy. One bad point is the bridge on my guitar: it is good 4 mm to high for the strings level and I must look for a new bridge or I must grind him 4 mm downer on each side. I had provisory utilized one of a other guitar from me: a french Dupont, The Aiersi had a better sound and projection as the French Luthier guitar that cost more than 1800 $. Furthermore the Aiersi Gypsy Selmer typ had at date only bronze strings mounted , I am enjoy of the possibility when I am ready with the bridge with good silvered gypsy strings that given a lot more clear and powerful sound. I bought A GPO4TS on 4/7/2017 and guitar is fantastic quality for the investment and sounds as good as it looks. Shipping from China to New York in 10 days.I highly recommend to put on Savarez Argentine strings and have the bridge action fitted to the player.Its funny they say comes with Imported strings from Daddario .Their factory is 10 miles from my job here in Farmingdale ,NY.I think they are very heavy Bronzewound strings the low E string is a .052 i think much too heavy for my soft hands.The action from the factory is rather high also to be bridge sanded to the players liking I guess.The overall appearance is unbelievable and binding,etc.No flaws on the outside whatsoever .Inside there are some small glue leaks but nothing thats a real problem.Overall I will buy from Aiersi again and the brown leafed pattern hardshell case is beautiful in itself very well made.They also threw in a real nice Aiersi logo marked Gigbag, a strap and polish cloth along with Trussrod wrench to finish it off.They pack their instruments extremely well .I dealt with Angella Chu from Sales department thru E-mails and she was fantastic and very helpful and professional. 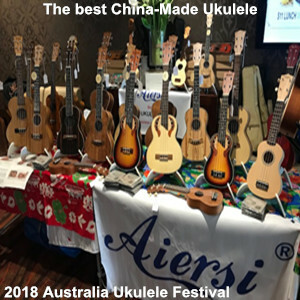 Thankyou Angella Chu from sales and Devon Zhu for posting Youtube videos of gypsy guitars that sold me once I heard them thankyou Aiersi Guitar Comnpany for making quality affordable Gypsy Jazz guitars and other musical instruments. I have already sent an e-mail but I have not yet had an answer. I want to buy the guitar but before I want information. I want information about the gypsy jazz guitar Spruce GP04TS. How much is it? The guitar is electrified? How much is shipping from China to Italy. Is it possible to pay with Paypal? Thank you!! Look your information. 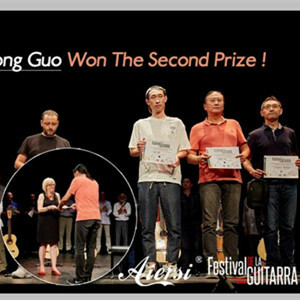 Thank you for your kind inquiry for our gypsy guitar .This is Angella from Aiersi music facory . I have sent e-mail to your mailbox ,please check . I look forward to your early reply .